After appearing in LustStories, SacredGames and Ghoul Radhika Apte is everywhere on Netflix. 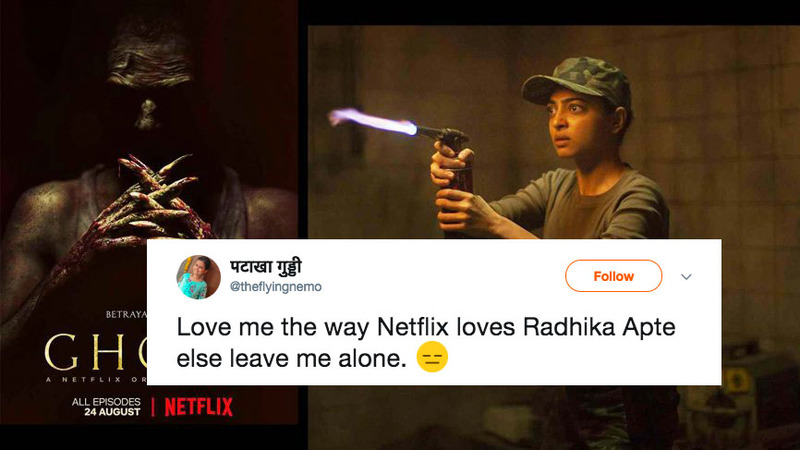 With Radhika Apte being a constant feature in most of Netflix's recent original content in India, Twitter outrages and trolls the streaming giant and most of them are very creatives and funny. We just listed down few Tweets and Memes which are too funny to be ignored. Many Indians pay 500 Rs a month to see Radhika Apte make faces. The role of Aamir on this comment is also played by Radhika Apte. When producers remove Radhika Apte from a series. Netflix HQ : 'show me the direction.' Translate it into Hindi and also suggest an actress. Netflix India : ummm,Rah dhika?? Netflix : Perfect,Radhika Apte is finalised. Radhika Apte is to Netflix India what the letter "K" is to Ekta Kapoor. Netflix is like IT cell for Radhika Apte, free flowing web content with uncensored abuses and a lot of money.